Every teacher on the planet knows that the first weeks of school are all about routines, routines, routines and more routines. There are the super obvious routines to discuss like what to do when you have to go to the bathroom or get water, what to do when you want to speak, how to turn work in and the list goes on and on and on. There are so many routines in our classrooms that some very important ones go overlooked. This guide discusses five incredibly important components of the workshop schedule and the routines you need to teach if you are planning to run a workshop class this year. These are routines that often go overlooked because they are a bit obvious to us but may not be to our students, especially students who have never done the workshop model before. Where to Sit: You can choose to let students sit where they want or create a seating arrangement. It is up to you and what you think your class can handle. Either way you'll want students sitting next to their peer conference partner so you can direct them to support each other when you need to. Where to Work: Students need to know your expectations during work time. Are they allowed to work any where in the room or will you require them to stay put in desks? I allow students to sit where they are comfortable and focused. I explain that if I observe they aren't focused in their chosen spot then I will choose their spot for them that day. Noise Levels During Work: You need to be very clear about what the noise level is during work time. Are students expected to write for a full ten minutes without talking and then another ten minutes they can whisper and get help or can they work and whisper the entire time? You could also designate certain areas of your classroom as peer conferring areas and other areas as quiet places. This can work depending on the class you have. If you have a super chatty class they may need you to carve out absolute silent time and use a timer so students know exactly how long they need to be silent. What to Do When I Don't Know What to Write: Teaching students strategies for what to do when they don't know what to write usually takes up an entire week or more of writing workshop mini lessons. You should definitely create a chart like the one to the right that students can always refer to throughout the year. 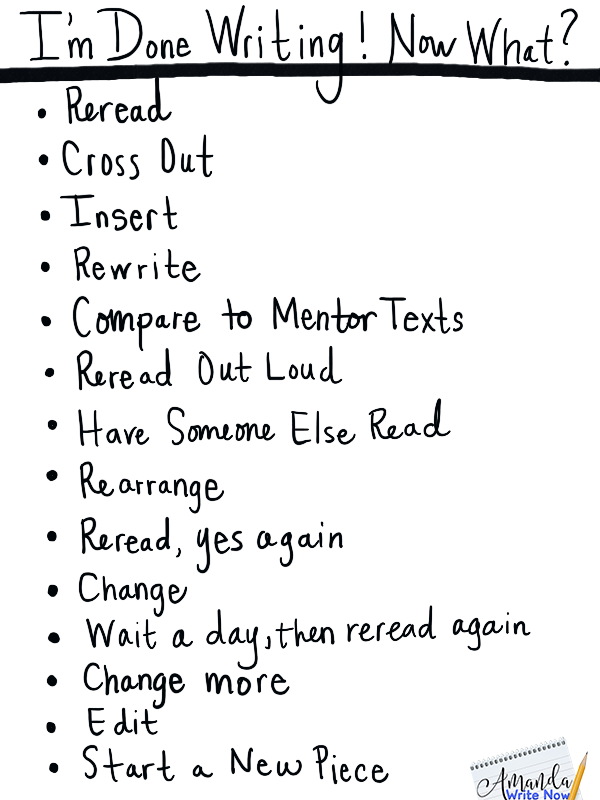 What to Do When I Think I'm Done: Teaching students next steps for when they think they are done writing is super important and also involves many, many mini lessons throughout the year! Students need a chart like this one to refer to when they think they are done. Who is My Partner: Announcing partners can be stressful for students and the teacher. I cringe when I hear negative sounds or comments from students about who their partner is. This is why I always preface partner announcements by saying, "It is important to remember to be positive about whoever your partner is. I realize sometimes people don't get along, even adults don't get along! But we keep our negative thoughts and comments to ourselves, it is the mature course of action. If you have any negative opinions please keep them to yourself. I should not hear any noises or comments when I make the announcements. Also, remember your partners change each month. If you are unhappy about who your partner is, try your best to have an open mind, you never know what you might learn and who you might meet because of this opportunity to get to know someone new!" What Do We Talk About: If you require students to meet with their partners each day or twice a week you need to explain and show exactly what you expect. One of the best ways I've found to do this is through a fishbowl activities. Pick two prearranged students to discuss their writing. Do I Have to Share My Work? You need to decide how and when students will share their writing with each other. All students should be allowed and expected to share some of their work with others. But...some super shy students may be incredibly uncomfortable reading their writing aloud to the entire class. This is why it is important to provide opportunities to share in smaller groups or in pairs as well as with the entire class. Shy students need to be given prior notice, support and practice sharing in smaller group settings before requiring them to share in front of the entire class. How Do I Share My Work? There are many ways to share work: popcorn read best sentence aloud to the class, read your best paragraph to your partner, read your first & last sentence to a group, read another student's paragraph aloud to the class, read your entire piece to your partner, go to four corners of the room, number off and then the teacher will call a number and that student will get to read their piece to the corner group. Routines are incredibly important for a smooth running workshop! Mini lessons should not only be about skills, they should also be about routines and behavior. Charts, fishbowls, explicit mini lessons and lots and lots of practice can definitely support you in establishing these all important routines.